I’m going to let you in on a delicious chicken pot pie recipe that you’ll come back to again and again when you’re in the mood for comfort food! 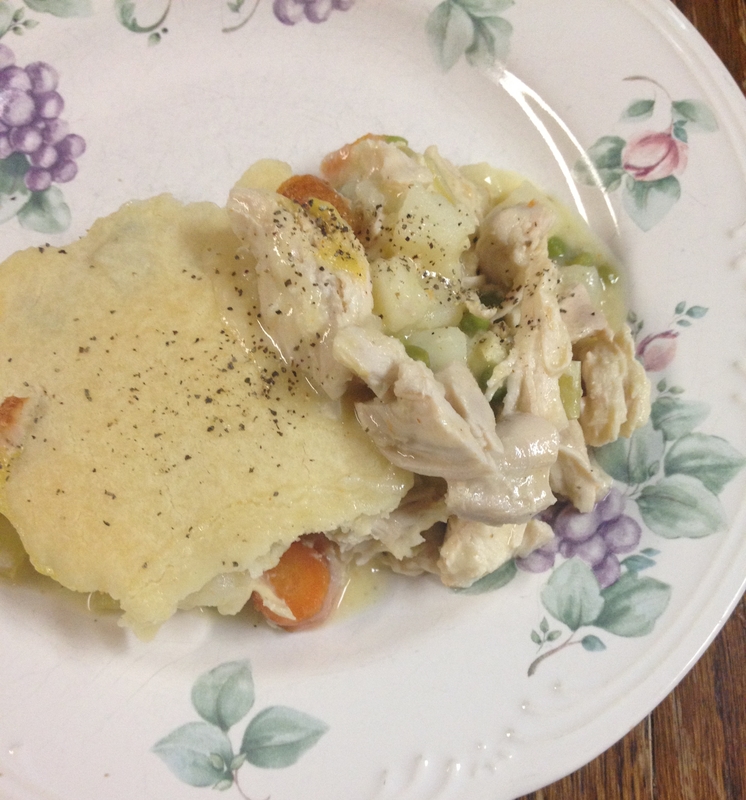 No, seriously…chicken pot pie can be delicious! Not only that, it can be easy without being ready-made and stocked in your freezer! Who else grew up on these things? Honestly, I liked a good ol’ frozen chicken pot pie every now and then as a kid. What is it about growing up that makes things like that not taste as good? I guess it comes with having a more sophisticated palate. I’m not a big fan of Hot Pockets or frozen pizza, either, and I used to think we had hit pay dirt when something like that showed up in the freezer! Now that I have more refined taste (and a hefty set of hips to maintain), I like to make things from scratch. I like to make things from scratch without killing myself, to be correct. This chicken pot pie recipe is so perfect, because it’s not difficult, it doesn’t use 80-million ingredients, and it’s really, really delicious. It’s a chicken pot pie recipe I found online and embellished it a little. 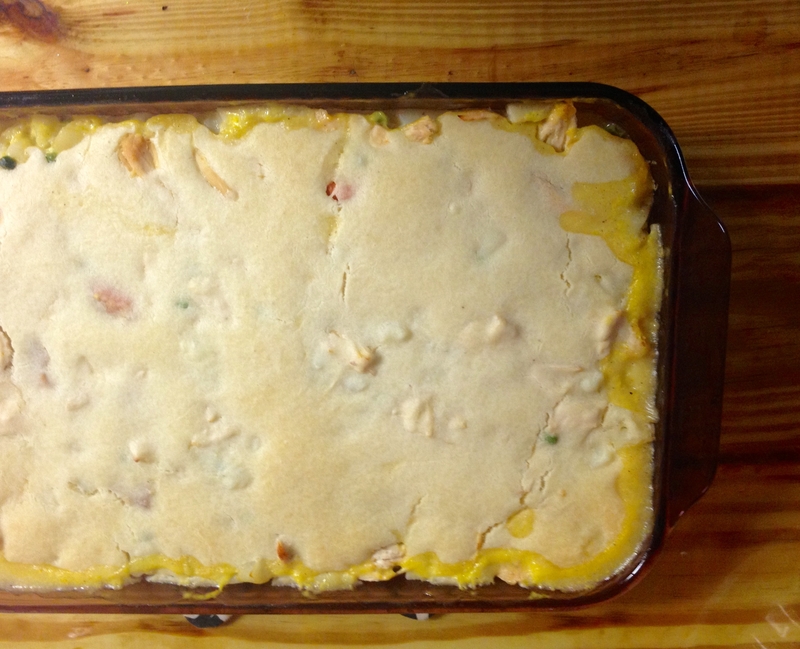 The original recipe is called Angela’s Amazing Chicken Pot Pie, and it’s on allrecipes.com. Someone came along later and added a photo that looks like a yummy, veggie-filled pot pie, but the recipe itself is pretty boring. Chicken and potatoes. White, bland, blah. The chicken pot pie filling should definitely be more colorful and exciting than that, but it’s the crust that makes this recipe so yummy, and easy. I’m telling you, this is the best chicken pot pie out there, if you make the changes I made. I used boneless, skinless chicken breasts instead of thighs. I’m a white-meat girl. I cooked my chicken in water, but added an onion, a couple of stalks of celery, and a few carrots for flavor. Plus seasoning. Like salt, pepper, and garlic powder. Chicken needs more than water to taste scrumptious. I used frozen hash brown potatoes instead of peeling and dicing potatoes. 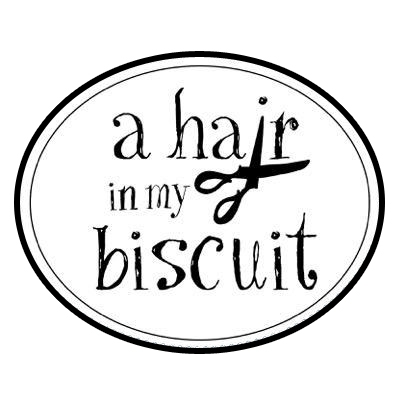 This is a huge time-saver, and I’ve shared that little secret before. I added some frozen peas to my boiling pot of yumminess in the last 5 minutes of cooking time. 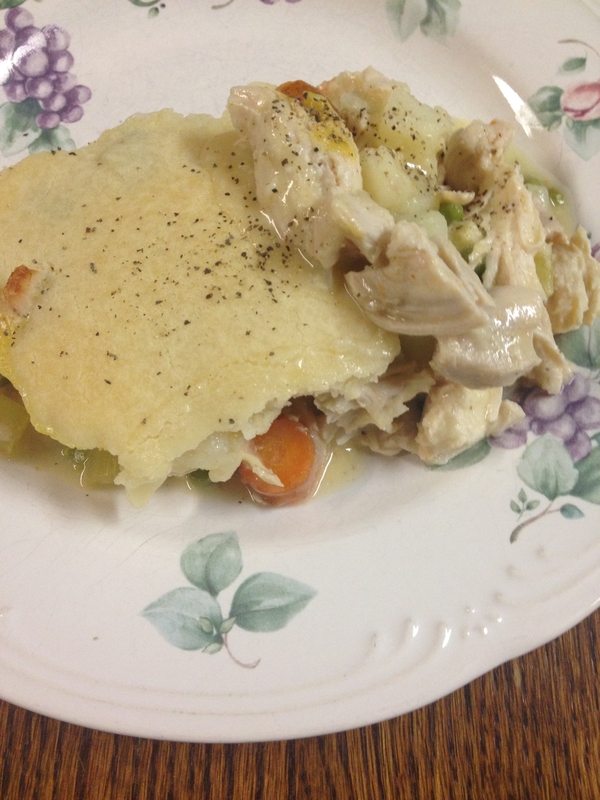 I used the same carrots and celery that I cooked with my chicken in the pot pie itself. Just let your veggies cool and little, and they’re easy to cut up. This recipe for chicken pot pie is really fool-proof. The crust is so simple: milk, butter and self-rising flour. Follow the directions, and make sure you let the milk/butter mixture cool. I did that, so that wasn’t my mistake. I had two bags of self-rising flour in my pantry. I grabbed one, and it turns out, is was very close to it’s “fresh by” date. It didn’t rise as much as I would’ve liked. Also, I have this lovely, wonderful, beautiful gas stove (I don’t dare call it the names I’m really thinking, lest it quit on me) that doesn’t brown anything except on the bottom. Honestly, I flubbed it up on purpose. I mean, you don’t think I really messed up the easiest chicken pot pie crust in the world, right? That way, when you make it, yours will turn out fluffy and golden brown, and you’ll be all puffed up thinking you’re a better cook than me! I’m so generous. Place the chicken breasts into the pot and cover with water. Add the carrots, celery, onion, and salt and pepper to taste. Bring to a boil, then reduce heat and simmer until cooked through, about 45 minutes. During the last 10 minutes of cooking time, add the frozen hash brown potatoes. During the last 5 minutes of cooking time, add the peas. Drain and reserve 2 cups of the broth. Let the meat and veggies cool for about 15 minutes, or until you can handle them. 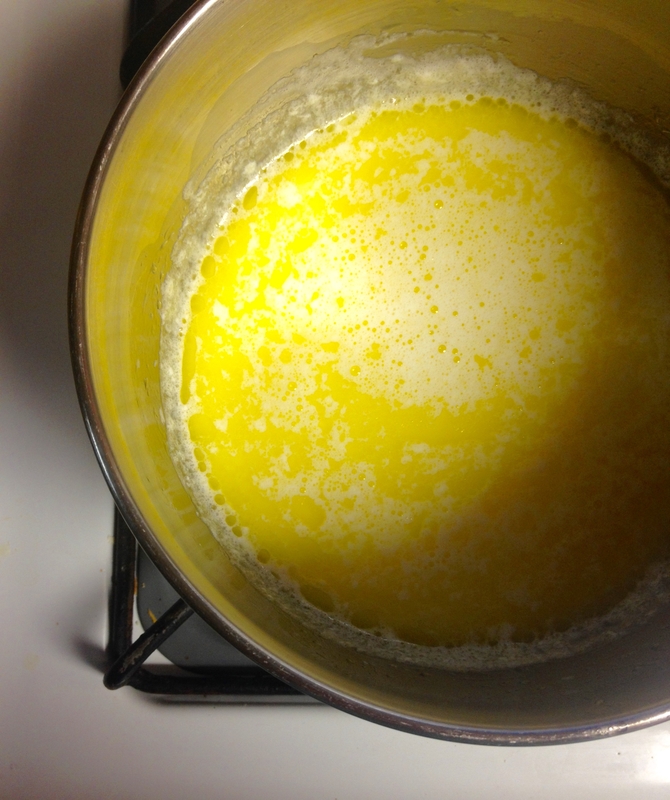 Meanwhile, bring the butter and milk to boil in a medium saucepan, stirring until butter is melted. Cool completely. Shred the chicken and cut up the carrots and celery. Discard the onion. Grease a 13"x9" baking dish. Place the chicken and veggies in the baking dish. Mix the 2 cups of reserved broth with the cream of chicken soup, then pour over the chicken and veggie mixture. 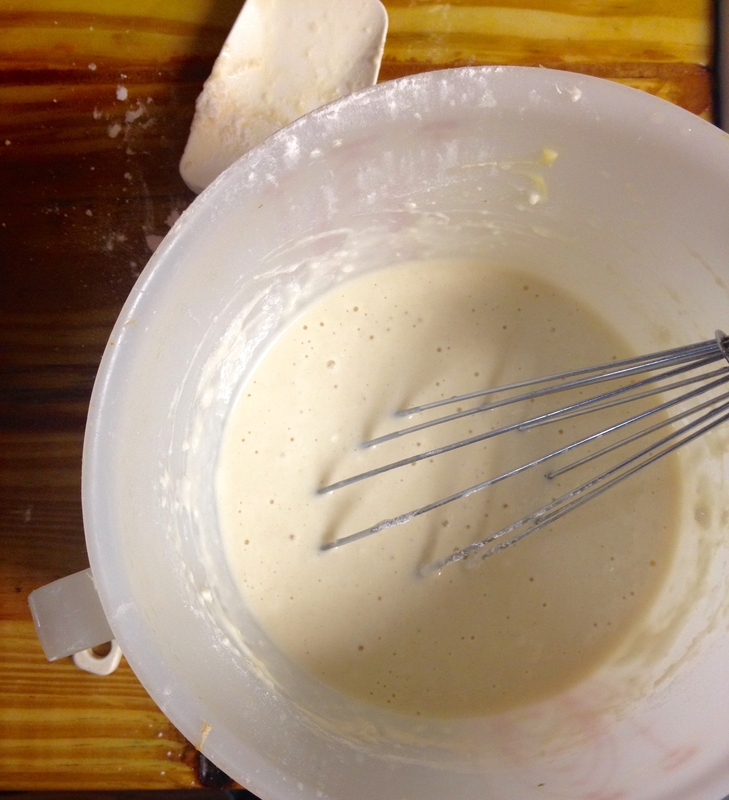 Pour the milk and butter mixture into a bowl and whisk in the flour until smooth. Pour this mixture over the chicken mixture, covering all. Bake until the crust is golden brown, about 40 minutes. No matter about the flat-ish, golden-without-the-brown crust…this was so delicious. It is perfect for a cold night, and your kids will love it! Trust me, if Tigger loved it, and she did, your kids will love love it. She’s my picky one, and she had seconds. Seriously? You changed EVERYTHING; so just write your own dang recipe! Gah! Yes, I added some things to this chicken pot pie recipe, but it’s still the same basic recipe, just with some embellishments. I have been known to get caught up in the ridiculous reviews for an undisclosed amount of time, shaking my head at people’s weirdness. It’s kind of like Facebook drama…you don’t want to read it, but sometimes you just can’t turn away. Anywho…I do hope you’ll try this chicken pot pie recipe, and I hope you and your family get warmed down to your toes from eating it! 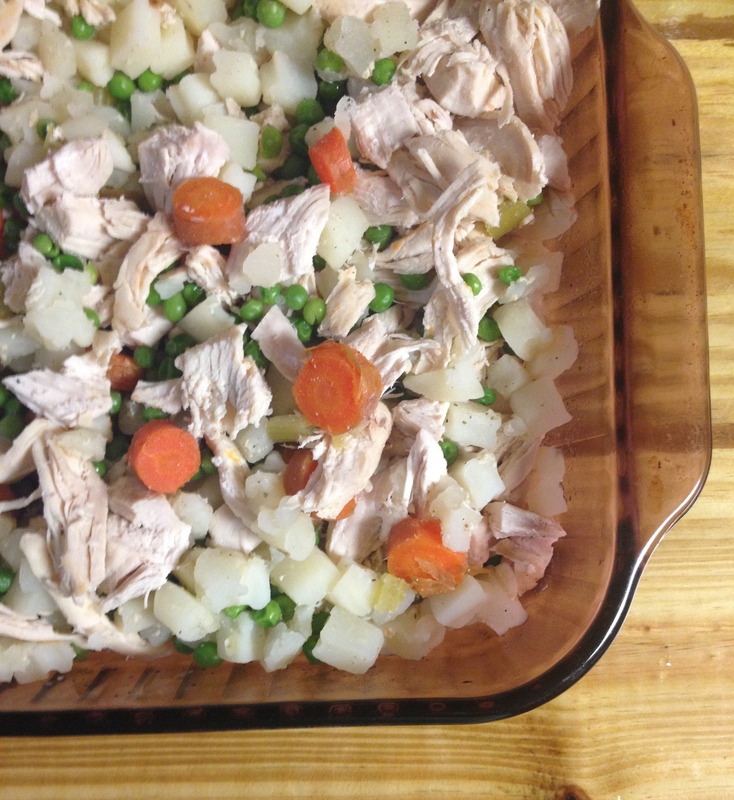 I’d love it if you found this to be the best chicken pot pie ever…it’s definitely way better than the frozen stuff! This post is linked up with Thursday Favorite Things! How I Rid My Old House of Musty Odors	Snowless Snow Day Margarita Mixer! 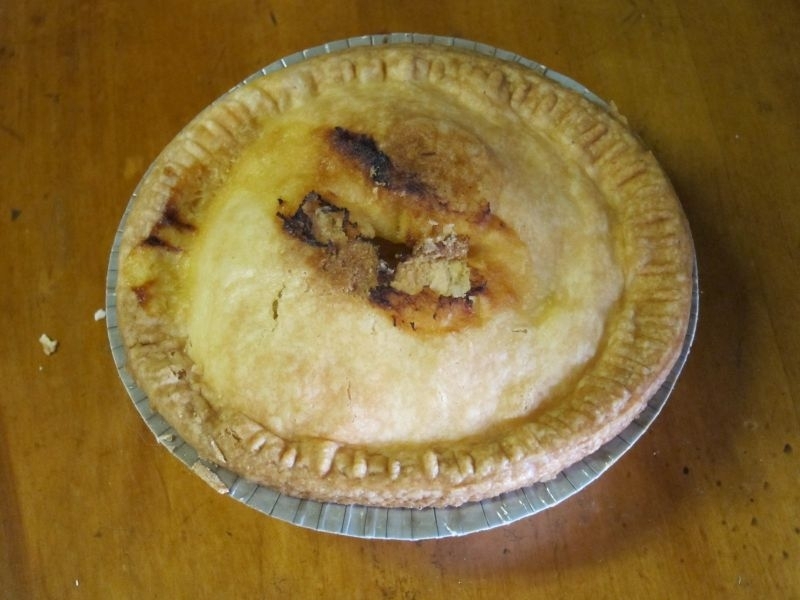 Uh…you’d have to leave out the butter, milk, flour….basically the whole crust. Just make some soup! Lol! What time will it be done? On my way! Martie, pot pies are such a comfort food for me. I love to make them. Yours looks yummy! Thank you for linking to #ThursdayFavoriteThings. I appreciate you giving the link numbers so I don’t miss your posts. Pinned and shared.